The appearance of the cat supplements you know and love has changed in Fall of 2017 but there is a good explanation! Please read on to find out why. 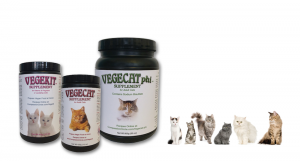 Cat formula updates for Vegecat™, Vegecat phi™, and Vegekit™ took place during our November 2017 production run. These formula improvements account for revisions made by the AAFCO in their 2015-2016 publication that lists minimum daily requirements (MDRs) for cats. Our supplements, along with the recipe ingredients, now meet or exceed all requirements needed for complete nutrition based on 2016 AAFCO standards. Previous versions of the supplements and recipes met AAFCO standards prior to 2015. We are excited to now offer even better supplements to support the health and well being of your cats and kittens. 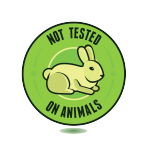 The kelp content of cat all supplements has been reduced. This lowered the iodine content in the diet. With the large reduction in kelp, nutritional yeast was added to the cat supplements to enhance flavor. Kelp was a palatability enhancer in addition to being the source of arachidonic acid in the old formula. New formula cat supplements contain a concentrated source of the omega 6 fatty acid arachidonic acid, an essential fatty acid for cats who cannot convert linoleic acid into arachidonic acid. The kelp that remains in the supplements is to meet the iodine requirement and is in a powdered form, so the kelp flakes are no longer visible in the powder. The kelp reduction and addition of nutritional yeast changed the appearance, texture, and volume of the cat supplements. The active ingredients in the supplement were not affected by this change. Vegecat™, Vegecat phi™, and Vegekit™ now contain additional amino acids, including lysine (a building block of L-carnitine) and arginine. Potassium and riboflavin (vitamin B2) have also been added. The gram serving sizes of Vegecat™ and Vegekit™ have remained the same but the teaspoon and tablespoon measure has changed due to the volume increase. Both the gram serving size and spoon measures of Vegecat phi™ are different with the new formula. The daily serving size, in grams, for all three cat supplements (for a 10 lb cat or 4 lb kitten) is 5.3 grams per day. Please see the revised recipes in the instruction brochures or the teaspoon serving size on the label to determine the amount of supplement your kitty needs. Contact us from the Contact page of our website with any questions or feedback. We love to hear from you and are here to help!